Slate: Can an app make you more creative? 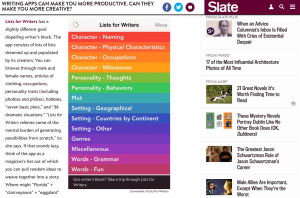 This week Slate covered our updated Lists for Writers app in an article about creative writing apps. It’s a good look at the differences between writing productivity apps and apps that help you come up with creative ideas for your writing.